Any mechanic will tell you: if you’re customizing an old bike, first make it work, then make it pretty. 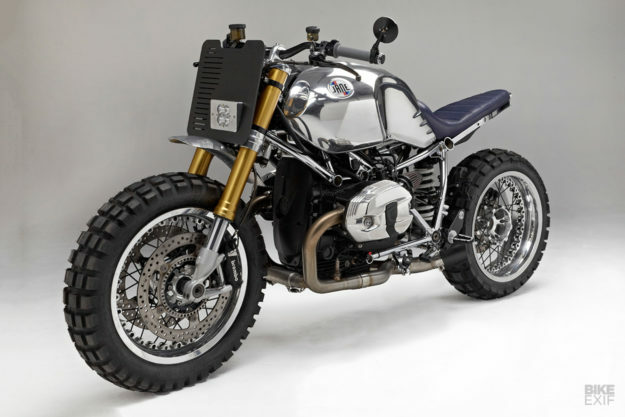 But if you’re working with a modern classic like the BMW R nineT, you can skip the first step. The R nineT is still a youngster and you’ll likely be working with a low mileage example—so there’s no need to worry about the motor. And with good suspension and brakes out the box, upgrades are optional. But if you dig really deep, you’ll run into the necessary evil that plagues all contemporary machines: electronics. It takes a lot of wires to make bikes run as great as they do these days, while still complying with ever-tightening Euro 4 standards. 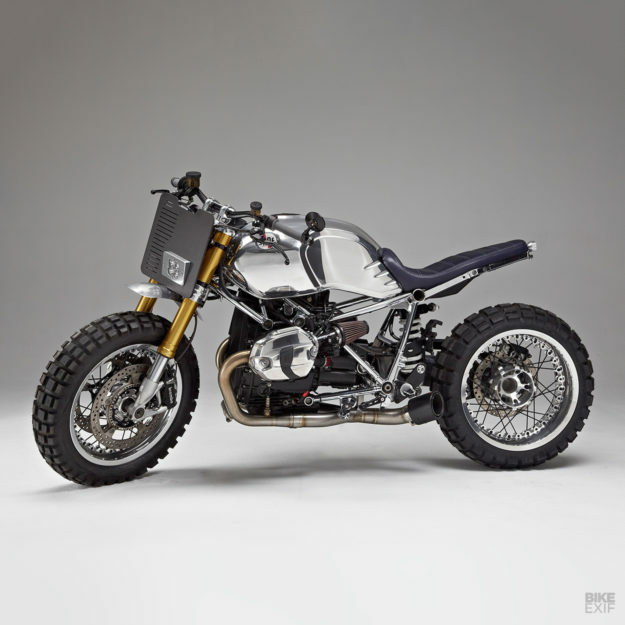 You’ll need to have your wits about you if you’re going to move things around—as Jane Motorcycles discovered, when they tore into this 2015-model R nineT. Jane Motorcycles is a stylish apparel, gear, coffee and custom moto shop in the heart of Brooklyn, New York. They turn out about four or five ground-up customs a year. This brawny Beemer was an in-house project—but it’s now for sale. There’s a lot of great detail to take in, but the hardest work here is what’s hidden—namely, a lot of wiring. 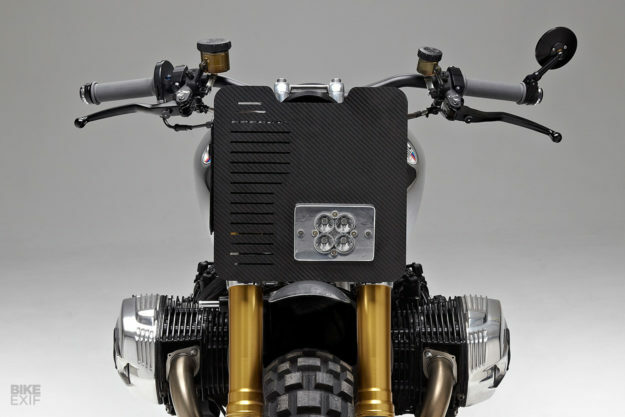 Once Jane had removed the R nineT’s airbox, they began by moving all the electrical components that used to lurk under the seat, into a new, custom-made ‘shelf’ inside the stock fuel tank. Jane also installed a Motogadget Motoscope Pro dash—a wise move, since it’s designed to plug into the BMW with minimal fuss, and supports all the stock functionality. 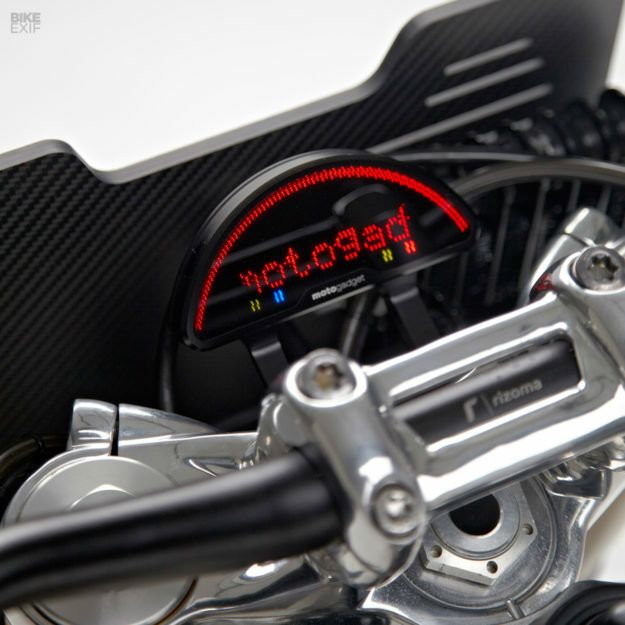 And they removed the keyed ignition in favor of an RFID system from Motogadget. The bike itself is a clean as the revised wiring. Jane stripped it down and de-tabbed the frame, then had it chromed before reassembling everything. 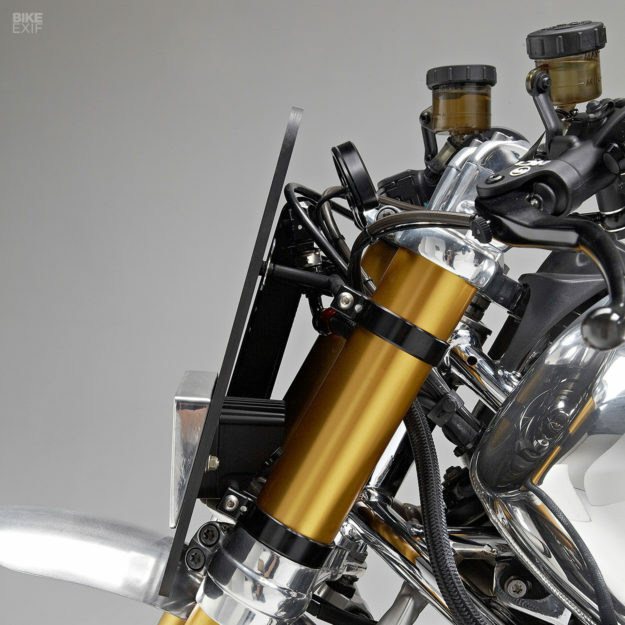 The valve covers have been redone in silver to match, and the tank, triple trees and swing arm have all been polished. The new saddle is custom made, upholstered in-house in navy oiled cowhide. Jane trimmed the subframe to match its length and shape, then topped off the rear with a small Prism tail light. The only component still installed under the seat is a Lithium-ion battery from Ballistic, housed in a custom box. To add a little more sano, Jane relocated the nineT’s oil cooler. It now sits up front, behind a carbon fiber number board that also houses a Baja Designs Squadron Pro LED headlight. It’s a neat arrangement, with a small high-mounted fender finishing things off. The nineT’s also kitted with K&N filters and a full Akrapovič exhaust system, with a stubby ‘muffler’ that we’re dying to lay ears on. For controls, Jane have installed Rizoma rear sets and handlebars, Magura master cylinders, a Domino throttle and Renthal grips. The rest of the bike features a grocery list of the finest parts, and we especially love the 17” Kineo wheels—with their unique laced-slash-tubeless design. 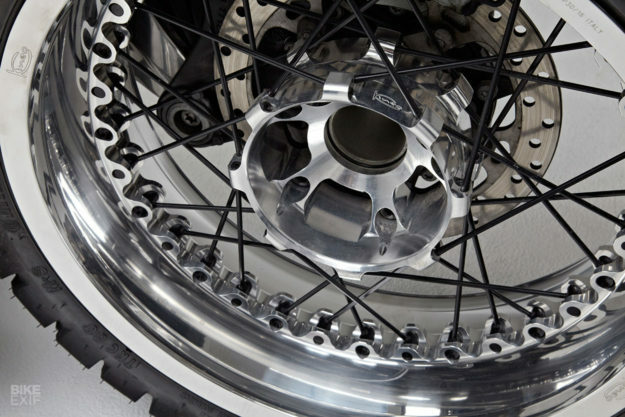 They’re wrapped them in Continental TKC80s, which despite the knobby looks, perform remarkably well on pavement and are a favorite with the road-going BMW GS crowd. 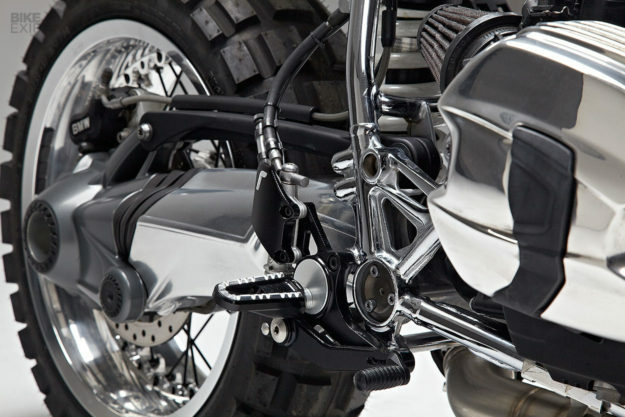 The bars are capped with mirrors and bar-end turn signals from Motogadget. And if you’re wondering where the license plate goes, there’s a nifty little mount lurking on the left side, just in front of the rear wheel. 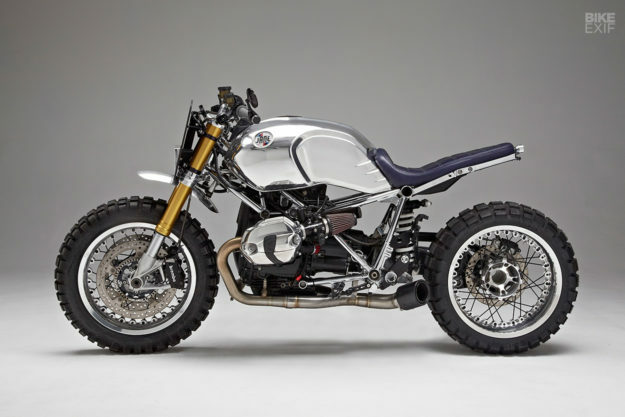 Thanks to Jane Motorcycles’ keen eye—and the patience required to fettle the wiring—this R nineT has a raw, stripped feel that makes it look that much more brawny. To us, it looks like the perfect urban brawler for tackling the streets of NYC—and slightly rougher terrain beyond.